Some groups of Jews organized to fight the Nazis. The idea of organizing armed resistance was first raised among the members of the Zionist Halutz youth movements in Vilna, Poland. Jewish Vilna, “The Jerusalem of Lithuania,” numbered 60,000 people before the war and had been notable for its internal unity and strong attachment to Jewish culture, religion, and Zionism. From July 1941 to the end of the year, two-thirds of the Jewish community was uprooted and taken to unknown destinations. A few survivors, who were wounded and shaken to the core, managed to make their way back to the ghetto, where they spread the shocking news that all the deportees had been taken to Ponary, located near Vilna, where they all were shot. All the roads of the Gestapo lead to Ponary. Doubters! Cast off all illusions. Your children, your husbands, and your wives are no longer alive. Ponary is not a camp–all are shot there. Hitler aims to destroy all the Jews of Europe. The Jews of Lithuania are fated to be the first in line. Let us not go as sheep to slaughter! It is true that we are weak and defenseless, but resistance is the only reply to the enemy! Brothers! It is better to fall as free fighters than to live by the grace of the murderers. Resist! To the last breath. This appeal stated that the events in Vilna were not local, but that Vilna was merely the first step in implementing the plan “to kill all the Jews of Europe.” This was the first time that a Jewish source, which did not have any information from either German or other sources, mentioned the total annihilation of the Jewish people. Moreover, this was the first appeal to call for revolt. For the first time, the demand for Jewish armed resistance was openly stated. In January 1942, the FPO (Fareinikte Partizaner Organizatziye, Yiddish for United Partisans Organization) was established in Vilna. The Jewish communal leadership in Poland, and especially in Warsaw, did not accept the dire prediction that all Jews under Nazi rule were doomed. Only the members of the Halutz youth movement initially accepted this, whereas other members of the community very slowly came to the realization of the truth under the impact of the deportations. From the beginning of 1942, there were attempts in the Warsaw ghetto to establish a fighting force. The major organization, the ZOB (Zydowska Organizacja Bojowa, Polish for Jewish Fighting Organization) was only established in July 1942, in the midst of the great deportations from the city. The smaller fighting organization, the ZZW (Zydowski Zwiazek Wojskowy, Polish for Jewish Military Union), which also took part in the Warsaw ghetto revolt and was founded by members of the Betar movement (the activist Zionist youth movement), was organized only at the end of that year (1942). The Jews who were sealed off in the ghetto did not have the means, the links, and the experience to build an armed force that would be ready for battle. They did not possess arms, an intelligence network, or links with allies outside the country. In addition, they did not have any military training, especially in urban guerrilla warfare. They were forced to appeal to the Poles, who had a strong underground military organization. Despite their considerable opposition to the Nazis, the Poles, who were generally anti-Semitic, were not willing to aid the Jews. Only in Warsaw was there established contact between the Jewish Fighting Organization and the Polish underground. The Jews received a small number of arms and help in transmitting information from abroad; sometimes, they were given other types of assistance. The Jewish fighters were also aided by a number of individual Poles and certain factions within the underground, who disobeyed the orders of the central underground organization. Most of the arms that were gathered in the ghetto, however, were acquired from other sources. Thus, some weapons were stolen from factories or arsenals belonging to the enemy by Jews and members of the underground who were employed there. Components of weapons were smuggled into the ghetto, where they were subsequently assembled. Weapons–mostly handguns, which were inefficient for street fighting–were also purchased from merchants or soldiers through intermediaries. Furthermore, a small factory was established in the Warsaw ghetto to manufacture hand grenades; there were very important when the revolt began. Another problem was the manner in which the ghetto fighters were regarded by the civilian Jewish population. In general, fighters use arms when continued existence through negotiation has failed. The struggle by the ghetto fighters could not end with victory over the enemy or with the achievement of security, succor, or even a postponement of their fate. A battle of this sort, which does not alleviate present misery or offer any hope for the future, is an extremely rare phenomenon in history, and by its very nature cannot involve the masses. Most people grasped at the slightest excuse for not gelling involved in this futile struggle, hoping thereby to save themselves and their loved ones. In many ghettos, the fighters were without broad support and were, therefore, isolated from the masses. Despite the many difficulties, revolts did break out in several ghettos. In Bialystok, Vilna, Czestochowa, Sosnowiec, and elsewhere, the fighters resisted or attacked. The one revolt that attained the dimensions of a mass, stubborn, and protracted rebellion took place in the Warsaw ghetto. This lasted from April 19 to May 16, 1943. The Jews of Warsaw were able to organize a resistance which cost the Nazis prestige, materials, and casualties. Moreover, Warsaw was the first rebellion in any occupied city in Europe. It tied down sizable forces of the enemy for a longer period of time than did many sovereign countries overrun by the Germans in World War II. The Warsaw ghetto revolt was unique for two other reasons. In Warsaw, the tens of thousands of Jews who had remained behind after the two great deportations of the summer of 1942 and January 1943 supported the idea of resistance and rebellion. Ghetto residents did not heed the calls of the Germans, did not report for selections (for deportation to the concentration camps), and hid in bunkers underneath the ground. These underground hiding places and bunkers were built over months: their locations and entrances were well concealed. Food and medical supplies were stored in there for prolonged hiding. Many bunkers also had arms. In actuality, most of the Warsaw ghetto in its last stages was an underground city that accommodated tens of thousands of Jews. When the Nazi soldiers came in to carry out the final deportation on April 19, 1943, they found a deserted city, with the way barred by hundreds of armed fighters. The two fighting organizations–ZOB and ZZW–numbered about 750 fighters in various positions, with a plan of action worked out to the finest detail. The rest of the civilian population had taken refuge in the bunkers and assisted the fighters in whatever way possible. Thus, all of the central ghetto of Warsaw became a partisan battle zone. The Nazis needed days of street fighting to capture each bunker individually, with the inhabitants of each bunker refusing to leave and sometimes answering calls to come out and surrender with gunfire. The revolt in the Warsaw ghetto had broad implications. The Poles were impressed with the revolt and realized that even a handful of people, with a minimal amount of weapons, could cause great damage to the enemy in city fighting, and could tie down large forces. 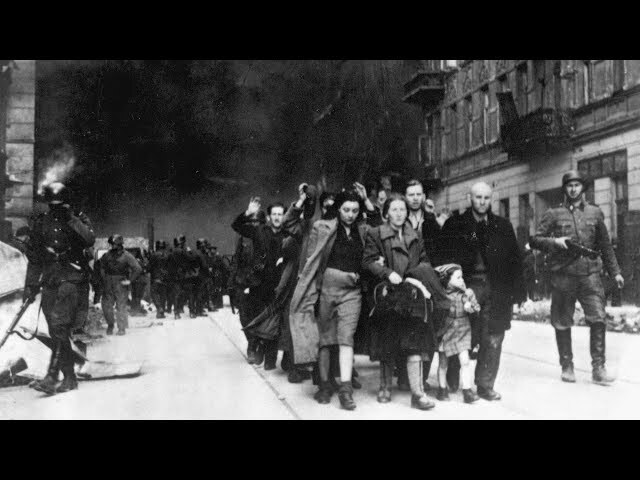 For the Jews, the revolt in the Warsaw ghetto motivated the underground cells and fighting organizations in other areas–Bialystok, Vilna, Cracow, Czestochowa, Bendin–to fight and maybe die rather than fall into the hands of the Nazi conquerors. It also inspired others to escape to the forests, where they joined the partisans. The Nazis learned a lesson from Warsaw as well. If they believed that the Jews would not resist, they were suddenly aware that the Jews could organize and fight with great valor and sacrifice. This was one of the reasons why they took steps to prevent further large-scale revolts in the deportations of Jews from other ghettos. The revolt in the Warsaw ghetto, and the revolts in the ghettos in general, became a symbol for those who fought for the independence of Israel, as well as a beacon for all of humanity. It has taught us how a small handful of people, without hope, in complete isolation, and in a depressed physical and mental state, could overcome all obstacles and embark on a heroic struggle. Reprinted with permission from Genocide: Critical Issues of the Holocaust (Rossel Books & Behrman House). Jews fought back against the Nazis in ghettos, forests and camps. How the Nazis incorporated genocide into their conquest of Europe.